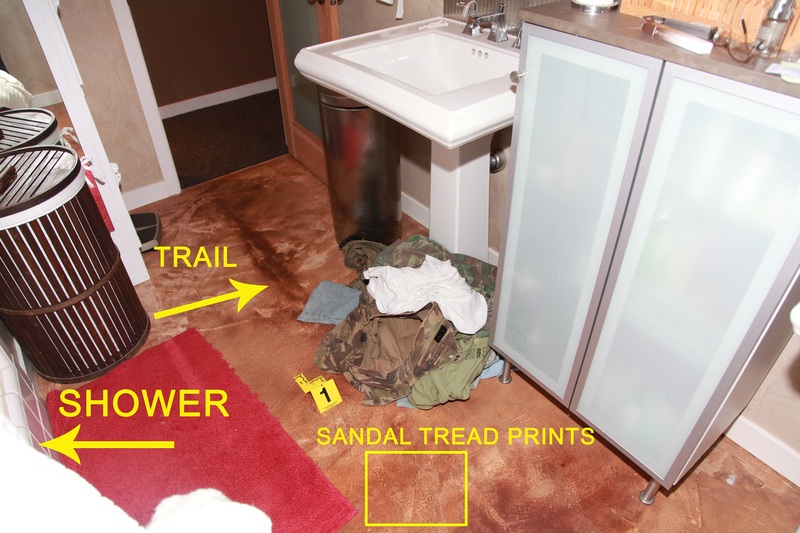 Photos taken by the Long Beach Police Department on March 4, 2014, show a dark trail on the floor running from the bathroom door and into the room. One theory suggests that Dana was in the bathroom when she was bludgeoned in the back of her head. Markings on the floor suggest that, at some point in the attack, Dana’s bleeding head was near the bathroom door, and she was dragged toward the shower. Bloodstains on the floor of the master bath? Note: Dana’s eyeglasses, which she was wearing when she last was seen on camera alive and well in the house, are in the upper right corner of LBPD photo img_00134. She would have needed her glasses to watch a video on her iPad. 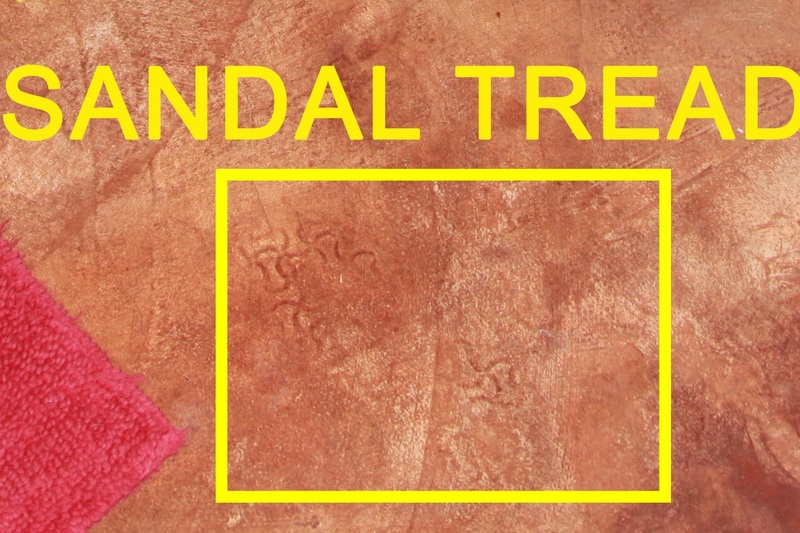 Reddish-brown tread prints from Birkenstock sandals can be seen on the bathroom floor. In home-surveillance videos, Huck can be seen wearing Birkenstock sandals on the morning that he called 911 to report that Dana had injured herself while doing yoga. One theory suggests that Huck tried to clean the bloodstains off the concrete floor, but was unable to remove them completely. 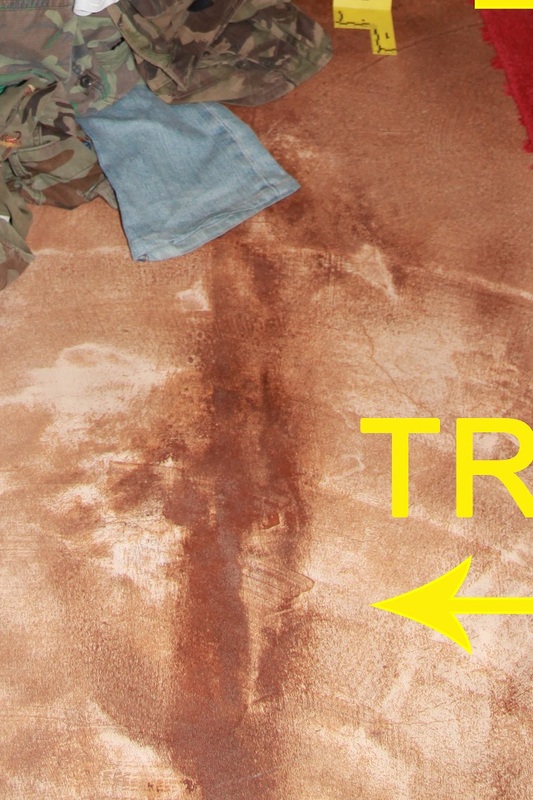 To further disguise the bloodstains, he coated the floor with decorative stain. He had experience using such stain in the past; he was a general contractor who had applied decorative stain to concrete surfaces throughout the house. View into the bathroom from the door. 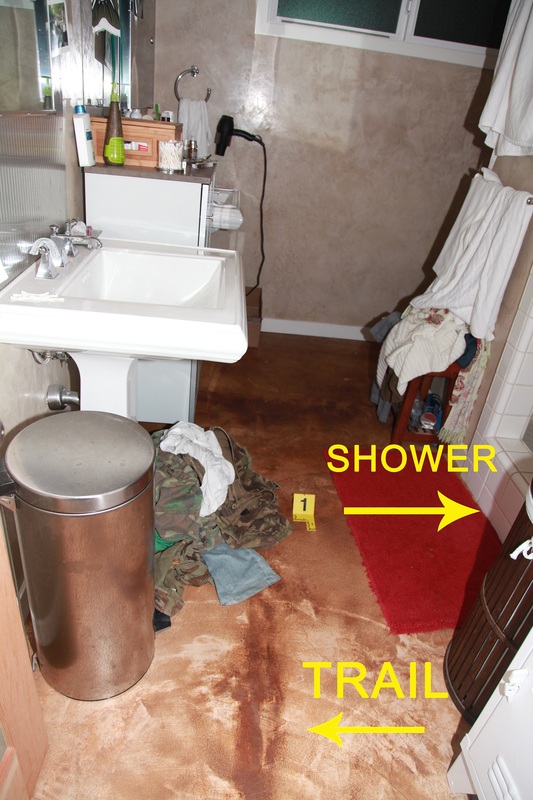 LBPD took several photographs of the master bathroom on March 4, 2014, but they did not test for the presence of blood anywhere in the house at that time. A full nine days after the alleged “accident” happened, LBPD Homicide Detective Todd Johnson returned to the house to conduct another search. At that time, on March 13, 2014, Luminol was used to search for blood in the house. However, the search was restricted to the so-called yoga room. The bathroom was not tested. Photo from a Philadelphia Police Department blood-evidence training course.